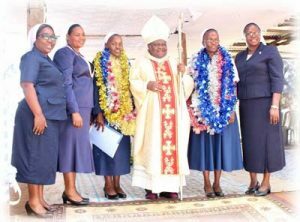 The Province of Africa celebrated the “yes” of six sisters from three countries during final vows ceremonies in April and May. 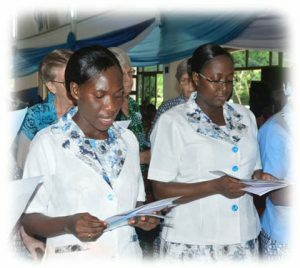 Sisters in Kenya, Nigeria and Ghana and the Provincial Council came together, arriving early to prepare, work and pray and to welcome family, friends, colleagues and many others from every walk of life for the perpetual professions at each celebration. Sisters Antoinette Cornelius and Irene Brookman Arthur professed their final vows on April 16 at Mary Queen of Peace Catholic Church in Cape Coast. Bishop Mathias K, Kobina Nketsiah of Cape Coast presided with concelebrant Father David Ocran, the parish priest of Mary Queen of Peace. The choir from St. John the Baptist Parish, Pedu, led the congregation in the singing and provided inspirational music. The opening song, All are Welcome, truly expressed the spirit of community, unity in diversity and a deep sense of mission as the procession entered the church. 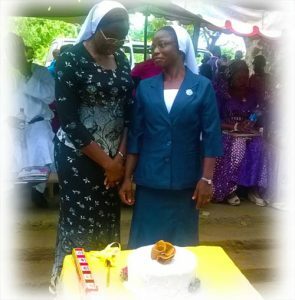 Sister Joyce Kwamboka Nyakwama, provincial leader, joyfully accepted Sisters Antoinette and Irene as full members of the congregation, and School Sisters of Notre Dame came forward to welcome them with gladness. 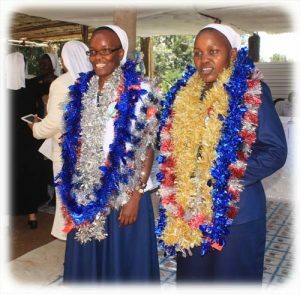 Sisters Norah Anne Mogute Oyagi and Lucy Kwalima made their final vows on April 30 at the Immaculate Conception Parish in Nyabururu, Kenya. Bishop Joseph Okemwa Mairura, of the Kisii Diocese in Kenya, presided over the Eucharistic celebration, which was held on the parish grounds. In attendance were all the School Sisters of Notre Dame in the Kenya area, the provincial council, families, friends and colleagues of the two professing sisters. Among those who attended were hundreds of parishioners from Nyamira, Nyabururu and Shiseso parishes, plus a large number religious and clergy. Inspirational music was provided by the St. Joseph Nyamira Parish choir, and there were many moments when the congregation was moved to dance. After the prayer of consecration and Sister Joyce’s joyful acceptance of the two sisters as full members of the congregation, the School Sisters of Notre Dame present danced their way to the sanctuary to congratulate and receive the newly professed sisters in their midst. Sisters Angela Ezugwu and Eunice Dagi professed their final vows on May 14 at St. John the Baptist Cathedral. The ceremony was presided over by Bishop William Amove Avenya of the Ghoko Diocese.